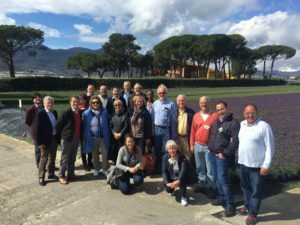 Union Fleurs, the International Flower Trade Association, has recently elected a new President and Board of Directors on the occasion of its Annual General Meeting held in San Remo, Italy on 14 April 2018. The new Union Fleurs Board of Directors will work for the next two years (2018-2020) under the leadership of Richard Fox (Kenya) as President of Union Fleurs, with the close support of Frank Zeiler (Germany) as Vice-President. In the 60 years of history of the organisation, it is the first time that the Presidency of the association goes to a representative from a non-European country, as noted by Richard Fox during his introductory speech as new President of Union Fleurs. This adequately reflects ongoing developments in the floriculture supply-chain at global levels which has seen in recent years an intensification of the role played by flower businesses operating in or sourcing from origin countries in Africa and South America. Richard Fox is the current chairman of the Kenya Flower Council; he has been extensively involved in the Kenyan horticultural sector for the past 25 years and has played a leading role in the promotion of socially and environmentally sustainable business practises in the industry. He has been serving on the Union Fleurs Board of Directors since 2008, holding the position of Vice-President since 2014. The election of Frank Zeiler, the Managing Director of BGI – the German Association of Flowers & Plants Wholesalers and Importers, as Vice-President and Chairman of the EU section shall also be seen as a much welcome step with the aim of strengthening the coordination, representation and promotion of the common interests of floriculture wholesalers & traders across the EU within the association but also in the context of Union Fleurs’ daily dialogue with the European institutions in Brussels. This will also be completed by upcoming initiatives to stimulate engagement, coordination and greater visibility of the pot plants membership within the EU section of Union Fleurs. Building on the refreshed strategic direction and key priorities for Union Fleurs worked out since 2014 by the outgoing Board of Directors together with the membership under the leadership of outgoing President Herman de Boon, the new President and Board of Directors will work closely together to steer the redefined strategic areas of activities of Union Fleurs and promote visibility and delivery for the benefit of the international membership of the association going forward. Over 25 participants from 11 countries attended the Union Fleurs Annual General Meeting in San Remo last week. Guests from other international organisations of the floriculture industry AIPH- the International Association of Horticultural Producers, CIOPORA – the international association of ornamental breeders and FSI – the Floriculture Sustainability Initiative, were also present and actively contributed to the exchanges of views during the 2 day-even which was hosted by ANCEF, the Italian member organisation of Union Fleurs. The programme included professional visits to pot plants & herbs company Vigo Gerolamo based in Albenga and to Biancheri Creations based in Campo Rosso. Participants were very positively impressed by the insights given during these visits on the state of play of the San Remo Flower Industry and its perspectives going forward. 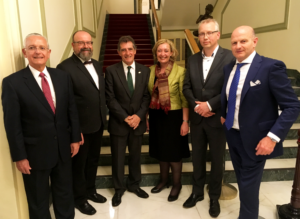 ANCEF President Paolo di Massa and San Remo Mayor Alberto Biancheri, who took part in the Union Fleurs meeting on 14 April, both highlighted in their speeches the renewed dynamism and exciting opportunities that lie ahead the San Remo floriculture industry. To pay tribute to the outgoing President of Union Fleurs, Herman de Boon, and recognise his outstanding service and contribution as a member of the Union Fleurs Board of Directors from 2012 and as President since 2014, the members of Union Fleurs unanimously conferred Herman de Boon the title of Honorary President of Union Fleurs during the closing Gala Dinner on 14 April at the San Remo Casino.